The common name Poinciana comes from the tree originally being placed in the genus of the same name. It has also been called flamboyant and, along with many other trees, flame tree. It has become naturalised in many countries into which it has been introduced, especially in Asian countries near the equator: in China, for example. For this reason it should be treated with some caution by responsible gardeners in Brisbane. Royal Poinciana, in good climates, grows up to 9 to 12 metres high. They have a wide umbrella canopy that usually grows wider than the tree is tall. This has made poinciana useful in hot climates as a shade tree because of its height and thick, wide canopy of leaves. Poincianas have a tendency to develop dead wood that attracts borers when pruned internodally: call us if you need a Brisbane arborist to prune dead wood from your poinciana. The poinciana has a relatively smooth trunk of a light brown color. It can start branching too low to the ground for people to walk under it, so should be pruned while still juvenile to eliminate low scaffold branches. For several weeks in spring and summer Poinciana is covered with exuberant clusters of flame-red flowers, 10 to 12 cm across. Even up close the individual flowers are striking. They have four fan-shaped scarlet or orange-red petals about 7.5 cm long, and one upright slightly larger petal–the standard–which is marked with yellow and white. The flowering ability of a tree is determined by age, genetics and environment. Poincianas shouldn’t be expected to bloom until reaching at least six years of age, sometimes older. If they have been grown from a parent or parents with good flowering genes they should flower prolifically with, ironically, either good nutrition or under stress. The poinciana’s compound leaves are striking. They are lacy and fernlike, bipinnate, and 30.5 to 50.8 cm long with 20 to 40 pairs of primary leaflets, each divided into a number of pairs of secondary leaflets. Being in the Fabaceae family, Poincianas are legumes so their fruit really is a bean. Their seeds start out green and soft, but become brown and woody as they age. They look like flat pods up to 60cm long and 5cm wide). Poinciana are commonly propagated by soaking the seeds for up to 24 hours in water before planting them in warm, moist soil. Instead of soaking, the seeds can also be nicked open allowing water to get inside the pods, and then planted immediately. An alternative method is to take a branch and cut it into 30 centimeter long sections, and then plant those in soil. Rooting hormone (auxin) will aid the cutting to take hold. 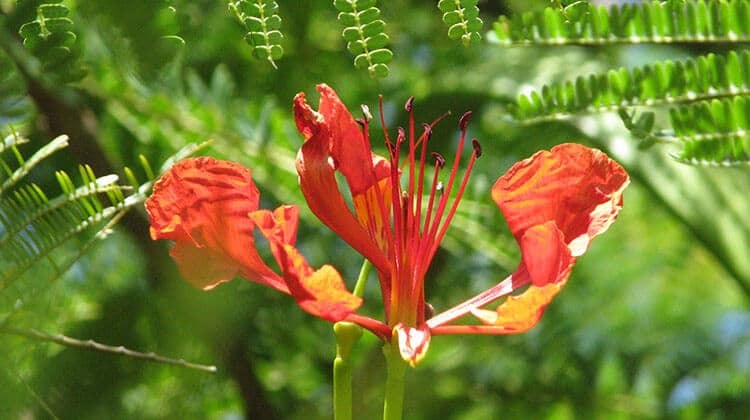 The Poinciana requires a tropical or near-tropical climate and full sunlight, but can tolerate drought and salty conditions. Poinciana prefers an open, free-draining sandy or loamy soil enriched with organic matter. The tree does not like heavy or clay soils and flowers more profusely when kept slightly dry. It is also tolerant of somewhat acidic and alkaline soils. Phosphatic fertilizer can aid in flowering and can be applied at the start of Spring. Juveniles can also be fertilized in Summer and Autumn with a 15:5:15 or similiar fertilizer. Growing Poincianas is an exercise in balance. We also apply organic fertilizer subterraneously when pruning poincianas to aid their recovery. Poincianas grow relatively fast, around 1.5 metres a year. Poncianas are susceptible to borers that usually attack Australian natives. They should be examined externally for tell-tale borer holes. Peel aside a little bark from any damaged wood and look for pin-holes. Borers can be killed mechanically by poking wire down the hole if caught early. Usually, it’s better to have us treat the tree by injecting an insecticide which is absorbed by the tree and kills the borers as they eat the wood. If in doubt, have us examine the tree as we can use instruments to check for internal borer activity. If left untreated, Poincianas may collapse due to damage to the heartwood and the resulting rot. Poincianas can also be attacked by the same Fusariam fungus that causes brown root rot, killing many jacarandas in Brisbane’s parks a few years ago. The Brisbane City Council has established a management plan using a Trichoderma species of fungi, though it is still in a trial phase. The DPI are extending the trial to other regions and will publish results in 2016. Officially, removal of affected trees on private property is currently recommended. Poincianas should not have mulch with pieces of wood greater than 25mm length applied to the soil within its canopy as this can aid in transmission of the Fusarium fungus. Schwarze, Francis WMR, et al. “Evaluation of an antagonistic Trichoderma strain for reducing the rate of wood decomposition by the white rot fungus Phellinus noxius.” Biological Control 61.2 (2012): 160-168. Perhaps the biggest issue I see from day to day with Poincianas is poor pruning technique. Poinciana branches that have been cut out from the trunk will do one of two things. Firstly, they can simply die, becoming dead wood that later falls from the tree. Until they fall they expose the tree to the entry of bacteria, fungi, insect and borer attack. Secondly, and even more commonly, watersprouts will grow from the cut branch. Poincianas have strong epicormic growth; that is, they have dormant buds along the branches. As a result new, spindly branches grow much faster than the section that was removed so the property owner has to have the tree pruned regularly. This is another example of it being more economical to have something done right, the first time. Further, poor pruning practices destroys the structural integrity of the tree as solid watersprouts are prone to snapping. I recommend only having Poincianas pruned by an arborist. One of the poncianas on the nature strip self-seeded so I took the seedling and put it in various pots until it reached about a metre high, then I planted it out in the garden. A friend has told me I’m crazy as it will kill the surrounding plants. I can easily move the ones around it, but am concerned about a large leukospernum a couple of metres away. I would love to keep it here, and am prepared to have someone come in to trim it (at what point does that need to be done?) but at what distance will other plants be affected by it? We live in Ormiston and are wanting to plant a ponciana in our front yard or on the council strip. Is there a certain distance we should plant it from the house? Also, do you know where we can buy an established one? And how established it should be, or not be, in order to establish well. Hi Vanessa, that’s a good question. QBBC (Qld building commission) and the Australian Standards for engineering of concrete slabs both suggest a distance of the mature height of the tree from the structure, and up to twice the distance in reactive clay soils. Do you know who sells mature ones in Brisbane. I tried Logan tree farm but they don’t have any at the moment. Hi David, My 15 year old poinciana has been ravaged by borer. All the ends of the branches are dead. The borer has also attacked nearby murraya and other plants. I haven’t been able to find anything in the gardening shop I could treat it with. Any suggestions? Hi Anne, and thanks for asking. Healthy poincianas can defend themselves against borers. Yours has underlying issues causing a lack of vigour which in turn allows the borers to infest your tree. I suggest you have it assessed urgently as borer-infested poincianas are prone to failure (breaking branches or breaking above the root crown), and therefore dangerous. If you wish to save the tree it needs to be diagnosed and treated. Thankyou. Who could look at it on the Gold Coast please. I have a 3 year old ponsiana tree in the ground, I have been covering it every winter, do Ineed to continue to do so.? as it is getting to big. Hi Kelly. It depends where you are located. You certainly don’t need to in Brisbane. I’m wondering if semi-mature poinciana trees can be transplanted? Our neighbours are wanting to remove their tree for a renovation and we’d love to have it in our front yard. The tree would be moved approx 15m from where it is now. We would employ services of arborist to transplant. Hi Claire, they can often be transplanted. If you’re in Brisbane I’d be happy to serve as your arborist. First, you’ll need the sites and tree assessed to ensure they are suitable. Thanks David. I’ll be in touch in new year. Hi Michael. Time of year has a reputation as an important pruning factor, but it’s because of high sap flow in spring in fruit trees. In our climate it’s all about how the branch is pruned, especially for poincianas. Lopped branches either die or form epicormic complexes, and both are dreadful for the tree. Only use a well-qualified arborist or the tree will be ruined. Hi. We have a large poinciana that is riddled with borer holes. We don’t want to have it removed is there a particular insecticide we can spray it with? We have very sandy soil. It is also covered with lichen. Not so concerned with this but it does look ugly. Is there a way to safely remove the lichen without damaging the tree? We have just recently removed a whole stack of trees from around it so hopefully with more sunlight on the tree we won’t get so much lichen any more. The tree has not been healthy for a while. Always has very sparse foliage. Hi Meagan. Pesticides have proven of poor value on poincianas. Borers only attack dead or quite damaged wood, so the key is to keep your tree in good condition. Removing the other trees should be of great help as it reduces the tree’s competition for resources. I suggest fertilizing under the canopy, watering it in well, and covering the ground in a generous layer of woodchip mulch. Lichen isn’t of itself a problem, though fungus is. Lichen is mould in the presence of fungus. If you can see any fruiting bodies then you should have the tree inspected. The same goes if there are borer exit holes in the trunk. Can you suggest an arborist on the Gold Coast? Hi Helen. No, don’t grow turf under poincianas. The main problem is the competition for resources between the lawn and the tree. I find they respond remarkably to having an exclusion zone of a generous layer of woodchip mulch of a 3m radius from the trunk. We have a magnificent poinciana in our front yard at Holland Park, Brisbane. Naturally we get many seed pods. I’m seeking advice on whether one can use the empty pods as kindling in our combustion stove please. 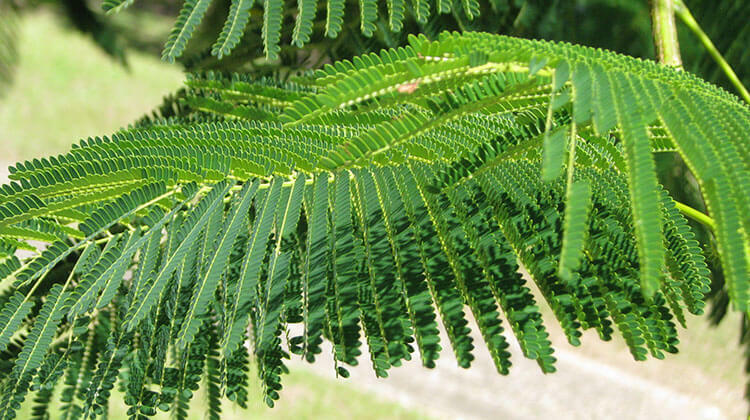 Hi there, are poinciana seeds poisonous for children? We have a beautiful Poinciana tree, which I guess is 20yrs old, and is quite a feature in our driveway. I’m a bit concerned re its health and would welcome any advice. We bought this property 3 years ago and this year the tree has not flowered. It was really full of seed pods coming into spring and summer, but did not flower this year at all. It is full of new leaf now, but there are some branches that are bare of leaf but still full of seed pods. Some of the main branches do have round “scars” where the bark has split and is peeling back a little. There is some fine dust on the bark in these areas. We did have no rain for 3 months in winter but there has been plenty since then. We are in Currumbin. We are high on the side of the valley so it is cooler here in terms of temp and we do get more rain. There are some green/grey mould spots too on some of the branches. That is what I have noticed. No evidence of borers. Is it all within the normal range? including for a tree not to flower one year? I was wondering about a similar thing with our tree in Loganholme. I bought the house last year and it’s my favourite tree on the property.The tree is quite large, so think it’s about the same age as the house, 20-25 years old. Last year most of the neighbours Poinciana trees were flowering quite profusely, while mine was lucky to have 3 flowers the whole year. This year, it’s the reverse. Mine has flowered brilliantly, while they had very little.The flowers only lasted about 6-8 weeks. At the moment, the tree is producing lots of new green pods which I’d only noticed brown on the tree before. I hadn’t touched the tree at all.It could be just the nature of these trees.Now I wish my Jacarandas would flower as well as the neighbours. Maybe next year. not to produce flowers & only lots of pods/seeds in some years. I just wondered about other people’s experiences. It gives some perspective. Hi! We have a Poinciana in our backyard that is about 80 years old. It is in magnificent health and flowers every spring well after Christmas. It has 4 major branches extending some 15m each, however one of the branches is very thick and strong and is extending much further out some 25m or so. My question is : Will this make the tree unstable to a point where it could be the detriment and uproot during a storm? Or will the tree start shedding or killing off this branch to make the root system more stable? Currently all roots are subterranean. I am wondering if I need to get someone to prune this branch or will the tree compensate for the lopsided weight? Hi Matthew. Good question. Our formula for branches of concern is L/D (length / diameter) should be <30. I look at removing weight from such branches with selective pruning of sub-branches rather than amputating the entire limb. The aspect ratio of the diameter of the branch to the diameter of the trunk immediately below it is also relevant. Larger diameter branch ratios are of more concern. That's also something we can remediate by pruning sub-branches as it slows down the girth-growth of the branch relative to the trunk. Poinciana branches usually fail one of the above two metrics, but we don't condemn them for that. We instead manage them pretty closely to mitigate risk of failure. So the answer is, yes. Your branch will need some pruning by an arborist - but not lopping or removal. I have a Royal Poinciana on my nature strip in the Redlands – Alexandra Hills. Does anyone know the council regulations regarding removal? I really would like to plant a native instead. Don’t remove it yourself. It’s a council tree on council land and you will be liable for a fine or the cost of remediation. You can ask the council to replace it with a different species, but they probably won’t. We have a pair of very old poincianass in our front yard and several months ago we were compelled to cut back one of them severely to comply with cabling requirements, leaving no foliage at all. We were heartened that the branches started to sprout shortly afterwards but these eventually died off and the street now appears dead a few months later despite ok our constant watering and provision of plant food. My wife wants to cut it down completely but I don’t want to if there is any hope of revival. Any thoughts? We live on the Gold Coast at currumbin. My inlaws have a poinciana tree that is over 30 years old and has apparently never flowered or seeded. Why would this be? Perhaps a lack of the right nutrients. A few regular light applications of rose or citrus food watered-in should rectify that. back to trunk and three stumps. Would it still shoot it’s now September . Thank you. We have moved into a house 6 months on ago on a semi rural property near Gladstone Qld. We have two large Poinciana trees, one at each end of the house. I am concerned about the root system as they have lifted and cracked the concrete footpaths in may places. Both tree trunks are centred approx. 8 metres away from the house. One tree is about 8mtr tall and the other about 10mtr tall. Should I be concerned for the house’s structural integrity? I’m just wondering how much more they might grow and whether they may cause any further damage. I do not want to cut these trees down as they are beautiful and provide magnificent shade. Just wondering if you have cut your tree yet or not. I am in exactly the same position. Got a poinciana tree approx 15 ft from.thr house. It has already started to lift the driveway edges a bit. Council wants to cut it down and I am thinking of keeping it if it doesn’t affect the foundations of the house. Any insight you have had in this matter would be appreciated. In my opinion, fifteen feet is too close. Eight metres is probably borderline. Check a botanical garden or some of the older suburbs of Brisbane to see how huge these babies can grow. You don’t hear of too many people having big problems with them though and they are prolific in this city. They can mess with pipes and concrete so – as with any large tree – it is best to give them some room. The root systems of many large trees can be at least as extensive as the canopy. We are just about to move to a property in hendra which is think has a massive one of these trees in the backyard. Went to check the property today and a massive limb had fallen, like big enough to seriously injure or kill someone. 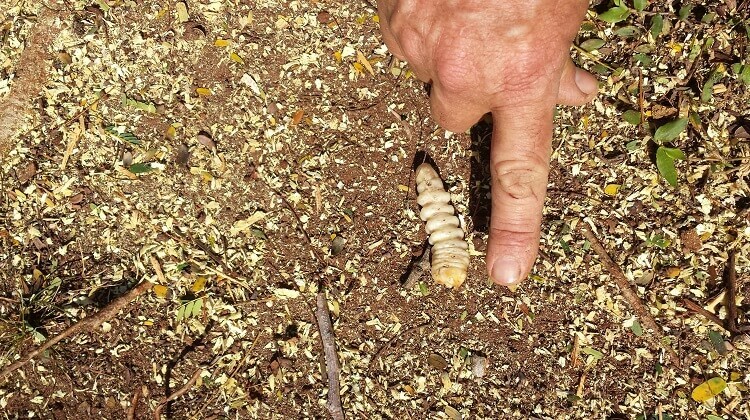 Did find a grub that looked like the one posted here. The real estate are looking into it but would Love to be able to refer them to someone who knows what to do so the tree is properly inspected and pruned properly. Hi David—Today I noticed a white,bubbly substance oozing from a very small hole on the trunk of a poinciana tree planted on our footpath by Council approx. 10 yrs ago. It appears a healthy tree and has flowered this year. The bark of the tree below the oozing looks damp and flies seem attracted to the substance—have not seen anything like this before —-what are your thoughts——Many thanks —B. I live in the Southern Brisbane suburbs. In the past week I noticed that my potted 4 year old poincianas seem to be drying out and I am thinking it is a bit a early in the winter to loose their leaves. I am concerned that they might be dying and looking for advice to save them. I can send pictures if you are interested to have a look. Would it be too cold to grow one there? JUST wondering about proximity to the house . We planted our seedling in 2010 , now getting big (and beautiful!) . It’s 6 or 7 feet from the house front? Is there a systemic treatment we can use for borers? We have a poinciana approx 6 yrs old. It seems this year to have lots of seed pods on it. Should i remove them or leave them to fall naturally? I planted a Poinciana about 12-18 months ago and have had continued growth upwards and upwards of new leaves, no flowers as yet. There is only one stork or trunk if I cut it, will it continue to grow? I live north of Townsville, beachfront position. MY question is, should I cut off the top of the trunk for it spread and form a canopy? I need some advice as local nurseries seem not to know what I should do. Many thanks in anticipation for your reply. Our neighbours have a poinciana that overhangs our driveway. At this time of year (Oct/Nov) it drops black “spots” all over our cars and stains the paintwork – especially on white cars. Are these spots bug poo, or something to do with the flowers? Is there any way to stop them other than not parking under it? l have a Poinciana tree that is 50 years old. It has been heavily pruned but has come back beautifully. We have pavers under the tree around a small garden which is up against the trunk. The pavers are lifting due to the large roots ;pushing them up. Is it okay to take up the pavers and prune the roots? Will this kill the tree? We don’t want it to die as it has great sentimental value. We live in Mackay, Qld.+ Thanking you in anticipation. I live on the gold coast and have a beautiful old Poinciana in the front yard and also need to cut a large section of the roots out on one side of the tree to fit a new carport. I am very worried about cutting the roots as I don’t want to loose our beautiful tree. if you get an answer about your root problems could you be so kind as to email me some advice. I had two 40 plus year old Poinciana’s, One in the front yard and another in the back. The back trees surface root system was badly damaged and it died, As a rule do not cut away or damage their root system surface or otherwise. Both of these trees have and had great sentimental value, and now we only have one left. My advice is to work around or in other words (with) the tree and pave pave around the roots! unfortunately I have had to cut away approx. 1/4 of the surface roots on one side of the tree as it was impossible to keep them. This was done last December and so far so good. Have just had all the leaves drop off and new shoots are sprouting all over the tree now. Which is normal for this time of year. haven’t pruned it as I didn’t want to stress it any more than what I already have. I am worried that it will one day just die but at this stage I have my fingers crossed. The tree should survive some root pruning as long as it isn’t too much. Large trees are often removed and transported to new locations. In these cases part of the root system is severed then allowed to recover before severing the next section etc. It will be done in three or four stages. In this way the shock is not too great and the tree can keep feeding. Severe root pruning can leave a tree with little means to gather nutrients and water while the root tips regrow. There is always some risk to a plants health when you prune roots (depends somewhat on the type of plant and root system) so make it as clean a cut as you can and wash your tools before and after you prune in a very weak water/chlorine solution. Cutting a few roots of a healthy tree shouldn’t be a big problem. Check out some tree farms for more insight into pruning roots and moving large trees. I have a poinciana planted 3 years ago, now approx 4 mts in height. Is it possible to transplant it. Am moving to a new property and the tree has great sentimental value. Have been told to dig a large circular pit around it, approx half mt from the trunk, line the hole with black plastic, water the tree very well and allow the roots to regrow into the plastic lined bowl. Are there likely to be any vertical deep roots? So far the largest we have come across would be about the size of 50c piece, at about half a meter depth. The tree is just making its move to shoot as we have had a very late spring; temperatures here in Perth are just beginning to warm up…. I have returned to a property after 5 years which has a very large poinciana. When I left it was very healthy with lots of green foliage and flowered beautifully. It is now quite bare and showing no signs of flowering this year plus on one or two of the larger branches there appears to be bark breaking away. I had an issue at the property in the last few months with a concealed water leak that water logged my hedge and close to killed it but the hedge next to the tree is fine.